Today I found out Rowan Atkinson, the guy who played “Mr. Bean”, has a master’s degree in electrical engineering. Atkinson originally received an undergraduate degree in electrical engineering (EE) at Newcastle University before enrolling in an EE master’s program at The Queen’s College Oxford in 1975. While working towards this degree, he also pursued acting on the side with a variety of clubs, including: the Oxford University Dramatic Society; the Oxford Revue; and the Experimental Theatre Club. The character of Mr. Bean, though not the name, was originally developed during this time period. The character’s modus operandi was to be a “child in a grown man’s body”, based on similar brands of “physical humor” comedy portrayed by such famed actors as Buster Keaton, Charlie Chaplin, and Jacques Tati (particularly the character of “Monsieur Hulot” portrayed by Tati). In retrospect, while an investment into master degree programs usually pays off in more traditional ways, the development of the character of Mr. Bean while in college surprisingly proved to be a more profitable use of Atkinson’s time than actual course study. The subsequent TV program based on this character lasted five years and was wildly popular throughout the UK with peak ratings as high as just shy of 19 million viewers. In addition to that, the two films made to date featuring this character, “Bean” and “Mr. Bean’s Holliday”, combined grossed nearly half a billion dollars worldwide in theaters ($250 million and $230 million respectively), while only costing $22 million to make the first film and $25 million for the second. In his early days of acting, Atkinson earned a truck driver’s license as a way to make extra money while he established himself as an actor. In the UK, a truck driver is called a “lorry driver”. Thanks in large part to the Mr. Bean character, along with various other roles he’s performed, Rowand Atkinson is today estimated to have a net worth of around $150 million. Atkinson’s oldest brother, Rupert, in 2000 barely lost the post of leader of the United Kingdom Independence Party (by a mere 16 votes). Buster Keaton, whose style of comedy was very similar to Mr. Bean, also inspired Jackie Chan’s brand of comedy, according to Chan’s autobiography. Keaton was named the seventh greatest director of all time by Entertainment Weekly. Further, he is ranked as the “21st greatest male actor of all time” by the American Film Institute. In his early silent films, he was known for delivering his brand of physical comedy with a completely straight face, which he found typically drew bigger laughs than if he was more animated in his expressions. Keaton was diagnosed with terminal lung cancer in 1966, but his doctors never told him he was going to die; they told him he just had bronchitis, though they knew it was lung cancer. His last wife, Eleanor Keaton, also died of lung cancer 32 years later. A major car enthusiast, Atkinson occasionally writes for different British automobile magazines, such as Car, Octane, Evo, and SuperClassics and has appeared on the motor vehicle show, Top Gear. He also owns several cars including the exceptionally rare McLaren F1, which he has wrecked twice, once in 1999 and once just a few months ago in August of 2011. In the first wreck, he rear ended a $600 Mini Metro car with his car worth then about $1+ million (today worth more in the vicinity of $4 million). In the second accident, he hit a tree. The McLaren F1 can go from 0-60 mph in 3.2 seconds and has a top speed of around 240 mph. McLaren only produced 106 of these cars. One of the earliest known performances of the Mr. Bean-style character done by Atkinson was in a 1979 show called “Canned Laughter”. 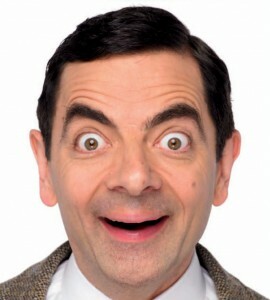 The character, while similarly portrayed as Mr. Bean, went under the name “Robert Box”. The name of “Mr. Bean” wasn’t thought up until after Atkinson landed the Mr. Bean show. During early production, they threw around a variety of names for the character, originally “Mr. White”, then several possible names based on vegetables and other plant life like “Mr. Carrot” or “Mr. Cauliflower”. Eventually, they settled on “Mr. Bean”. Other notable characters done by Atkinson include: Zazu on Disney’s The Lion King; Johnny English; and various characters on the historical sitcom Blackadder, among many others. The Queen’s College Oxford was founded nearly 700 years ago in 1341 by Robert de Eglesfield, who was a chaplain to the wife of King Edward III of England, Queen Philippa of Hainault. The city of Oxford was originally named Oxenaforda, which just meant “Ford of the Oxen”. Not the nine o’clock news was his early breakthrough followed by Blackadder. Blackadder was and is legendary. It was also the show where Hugh Laurie made a serious contribution. I’m surprised “Not the nine o’clock news” isn’t even mentioned.